Australia and her scary and not-so-scary critters | Where to next? Fellow blogger, Cryptic Garland, recently did a post with a pic of a huntsman spider clutching her egg sac that most likely held a gazillion baby huntsmen. It started a flurry of comments about Australia’s deadly creatures. We’ve got more than our share of snakes and spiders in the world’s top 10 most poisonous. And of course there are the sharks too. We’ve hosted many exchange students and most of them come to the country terrified that they will encounter the ‘Three Esses—spiders, snakes and sharks’ probably all on the first day. I always thought they should have been more concerned about liking school, making friends and fitting in with their host family. But I digress. Another frequent visitor to the lake. This is a darter, rather than a cormorant. 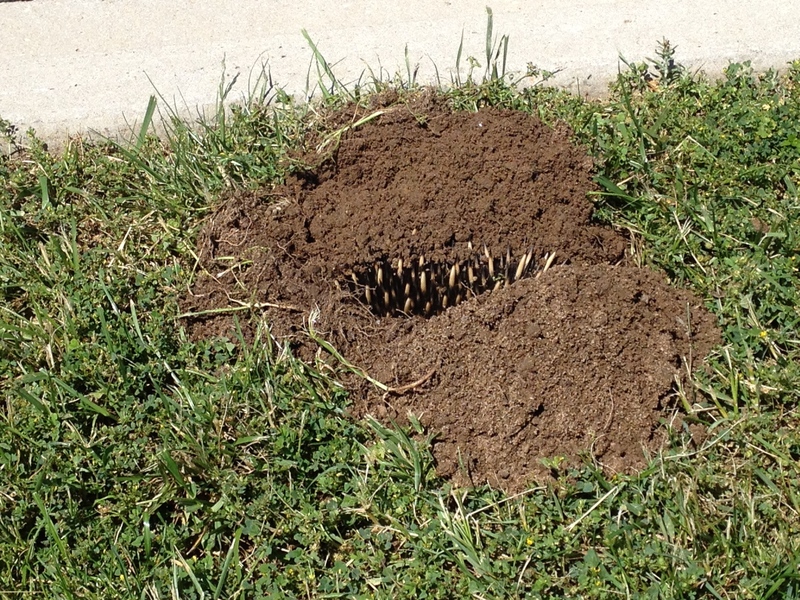 The flurry of comments didn’t make a single mention of the prickly critter I saw while walking the dog. Lately I’ve been walking Indi, our standard schnauzer, around Lake Burley Griffin, a manmade wonder that graces the centre of Canberra, the nation’s capital. It’s a gorgeous and popular place to be when the weather is nice. We see plenty of people and dogs, as well as an array of birds and bunnies, but Saturday was the first time we ever saw an echidna. According to Wildcare Australia, echidnas are the oldest surviving mammal on the planet. Their page on echidnas is full of interesting info, so I’ll tell about our experience instead. We got out of the car near one of the memorials scattered around the lake, and there it was trundling along with purpose. Of course, it was headed straight for the small road that runs alongside the lake, so Indi and I swung around in front of it in the hopes of directing it back towards the lake. It did so obligingly and I was so proud of Indi (who was on her lead) for not barking or trying to torment the echidna in any way. In fact, we walked alongside it for 20 to 30 minutes, with Indi often sitting and gazing in wonder. We kept a distance of about two metres and pointed the echidna out to all the passersby. It is rare to see them out in the open like this, and for many it was their first time seeing one ‘in the wild’. One woman approached to say she had seen another one farther back along the path and had called the ranger to ask what to do. According to the ranger, this is the time of year when echidnas move about a lot and to not worry about them unless they are injured. Our goal was to keep this one from getting in the road and getting run over, so our walk was aimed at getting it to a place much farther from the road. The echidna had other ideas. About 20 metres short of where I hoped we’d get to, it did a 90-degree turn and headed straight for the road. By then about 10 people were crowded around. I think our little friend had had enough. As we watched, nervous that it might tumble into the road, it instead started to dig itself underground. I had no idea echidnas could do this, and apparently when they do, there’s no way of getting them out unless you dig a huge hole around and under them. One fellow realised this very quickly. The echidna had only just started to dig, when this guy took the pillow out of his kid’s pusher and tried to pick up the echidna. He couldn’t budge it. It was as if its feet had grown clamps. So we all stepped back and watched it bury itself completely. Wow! I guess they really are solitary, and certainly not very scary. Indi and I went back on Sunday to check on it, but the echidna had moved on. If you’re in a hurry to move on, you might check out another one of our lakeside walks or a recipe on my cooking blog. How lucky were you to see this little vignette in the life of an echidna. I’ve got my fingers crossed that one day, I’ll see a wombat in the wild. We have wonderful animals. Vignette—what a perfect word to describe the experience. Thank you for sharing it. Yes, we do have wonderful animals in Australia. I’ve seen echidnas in the wild before and a wombat once near Jenolan Caves. That was in 2004. It is so nice to see any of our wild (native) animals out where they want to be. They do disappear quickly when they decide they’ve had enough. And thanks for the link Peggy. Thanks for prompting me to do the post. Your spider gave me the idea. And I think they call it team work!! That reminded me of the mole that escaped one of our cats (http://fionasfavourites.com/2015/04/25/pearlis-pickles-iv/), but more than that, of the visitors to Africa and more particularly, urban South Africa, who believe they will meet lions and tigers (ahem!) wandering the streets! You do have some wonderful wildlife in Australia, and what a privilege that was! Oh Fiona, your comment made me laugh. Having spent a lot of time in Africa, including South Africa, I can appreciate the questions you must get. We get the same in relation to kangaroos, but they really do hop down the main street sometimes. I awoke one morning and a kangaroo was standing in my front yard. And I just checked out your link. What a great story about your cat and the mole. I thought it might, Peggy. And Pearli is quite a character, thank you! I do know about the kangaroos in the street – I have a school mate who lives in Mypolong and other friends around the country, including in Canberra. A uni mate lives in Melbourne and tells of waking terrified one night to find a possum trying to get into her bedroom window! That said, we had an all-too-freindly Cape Cobra on our veranda last summer…. The joys of country living – we also have the three S’s here, as you know. Happy day! Loved the pics of Pearli and the mole. And thanks for the reminder about possums. We’ve had too many in the house. One story, in particular, is hilarious. Might have to write about that one day. Not sure how I’d cope with a cobra. Hahaha! I can relate to that. We went to meet some Malaysian delegates at the airport a few years ago in Lusaka and as we left the airport grounds we saw them looking around a lot and we wondered what was going on. Finally, they asked where all the wild animals, i.e. lions, giraffes, etc were. They were surprised and disappointed to learn that big game animals lived in the bush very far from the city or in zoos, if the in the city. They thought Africans who live in cities ran into rhinos and lions everyday. Oh my, I can just imagine how those delegates were looking every which way to make sure they didn’t get pounced on by a lion. Thanks for sharing that. On one of my visits with my friend, Crystal, we spent a day on Kangaroo Island off the coast from Adelaide we happened on to a small echidna near the car park where later I was chased by a crazed and scary ostrich around several cars as though I were its lunch! Oops, digressed. Our small echidna appeared more frightened than anything so went on with our planned short hike to cliffs overlooking seals frolicking on the seaside rocks a few hundred meters below. Upon our return to the car park we checked out our echidna who had moved just two or so meters to a nearby tree where I suspected it was planning a dig in just like yours. We moved on to finish our tour and meet our only ferry back to Adelaide. As an aside Kangaroo Island is worthy of an overnight stay making for a two day visit. Oh and my friend the ostrich did not catch me however came far too close for comfort. Had it been a cassowary I’d have been dead. 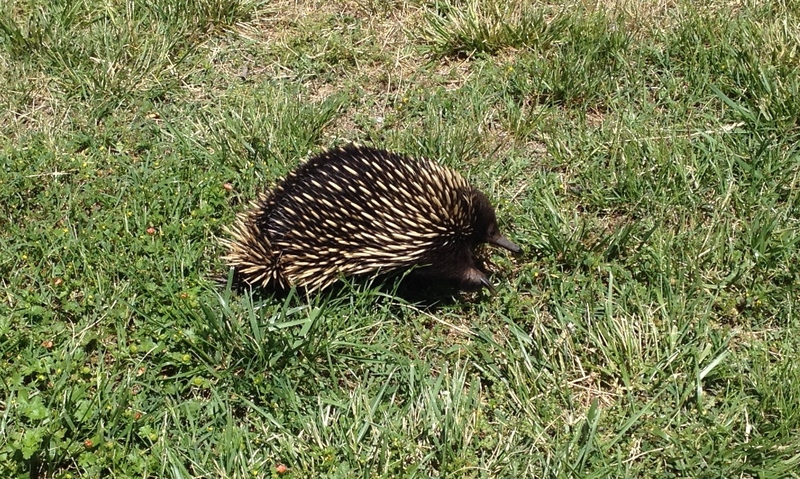 How nice to know you’ve seen an echidna in the wild too. As for being chased by the bird. It was probably an emu rather than an ostrich, and they are very bold and hungry. Years ago, one stole a sandwich out of Libby’s hand when we visited Tidbinbilla Nature Park. Thanks for the tip about spending a night at Kangaroo Island. I haven’t been there, but it’s on my list. Thanks. It was a challenge because I only had the phone with me and I hesitated to move too close with the dog in tow. Wow! Isn’t that amazing. I had never heard or seen one of these prior to today so thank you! Thanks for stopping by. Echidnas are Australia’s equivalent of the porcupine or hedgehog. Love how they bury themselves! Me too, and even though I’ve lived in Australia for more than three decades, I didn’t know they could do it. What a fun comment, but Ralph you didn’t mention the Drop Bears. They are the scariest of all. Mind if I reblog your post, I think some of my followers would find it pretty interesting? Ralph, you are most welcome to reblog any of my posts. And when you come to Australia, I’ll try to protect you from drop bears. Never heard of this creature before, reminds me a bit of a hedgehog – cute!! I would much rather meet one of these than one of your three “S” creatures!! Echidnas are so cute, and really harmless. We see a lot of spiders and I am quite happy to deal with them. Sharks and snakes rarely cross my path. Don’t mind spiders as long as they are not too huge…. sharks and snakes, well that’s a different story, any size would freak me out!! There are some really tiny sharks and snakes that might not scare the dickens out of you. Wow! Very cool animal. I read the info page on them. I wonder if they are related to our porcupines? They’re not related to porcupines but the spines make them look similar. Hedgehogs are another spiny animal. They are cute. I wish I could have taken a better pic of their feet. What fantastic shots of the echidna – cutie pie. I am looking forward to when I finally get to visit the Antipodes. Thanks. Let me know when you come. We’re good tour guides but can’t always guarantee echidnas in the wild. Thank you – it might be years but I appreciate the offer. This is so cool – love it. You should definitely track that echidna down so you can give him (her?) the pictures for it’s family album. It will be able to share the story with it’s grandchildren some day of how curious (in both senses of the word) we humans are. We’re still walking around the lake, but no sign of the echidna. The main Defence Force building is near the lake, and I heard that some Army fellows rescued an echidna that was crossing the road bridge over the lake. The little daredevil. Wish I’d thought to switch to video. Then you could have seen the dirt being kicked up. Thanks. Right time, right place. Your encounter with an ‘S’ is about what happens for most people. I had no idea the echidna was so old, and I was almost as surprised that Indi behaved so well. I’ve only seen an Echidna in the wild once and that was on a back road deep in the countryside. Thanks for sharing the info about them. I never knew they dug holes like that. Sometimes I think my school education was abysmal. I can speak a few words of French and tell you all about the Egyptian pyramids, but I’ve only learned about my own Country through my adult life. 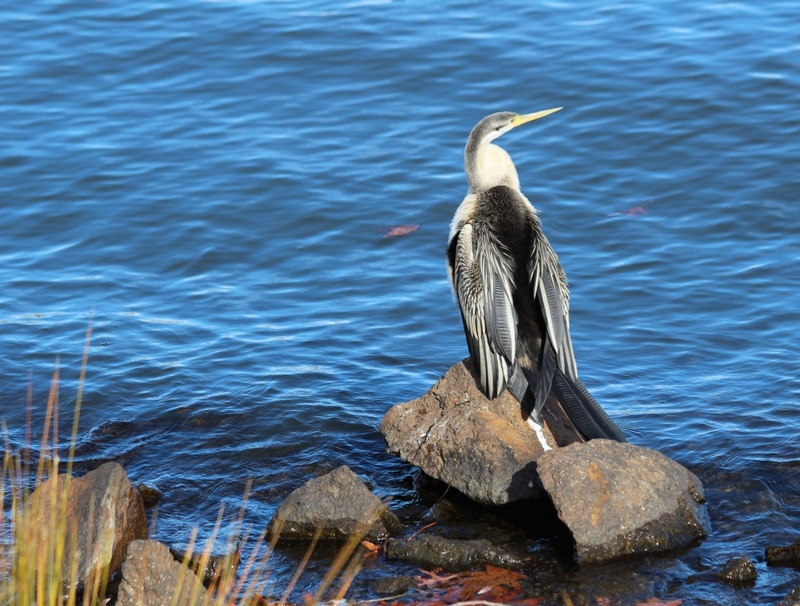 (By the way, the bird is 100% a Darter (Anhinga melanogaster) and is almost sitting in the same position as the photo in my Australian Bird Guide. All Cormorants have that hook or curved end of their beak. I’ve only seen a Darter twice – on the island in the middle of the Ornamental Lake, Royal Botanic Gardens in Melbourne). Thank you, thank you, thank you for clarifying the bird type. We gets lots of darters and cormorants on the lake, and I forgot about that identifying hook on the cormorant’s beak. I’ll go fix up the caption. Great story. There is a fascination and horror about all our deadly creatures but recently a UK/Aus comic in Edinburgh asked us, the audience, how many had encountered such deadly creatures. Many Australians were in the audience but no hands went up. Then he asked who had been attacked by magpies. Half the audience raised their hands. What a great story you’ve shared about our deadly creatures. I’ve been swooped by magpies many times. And most Australians would agree that our biggest menace is flies. Your post with your great photos and the comments have highlighted how some of our fauna have achieved fame for the right or wrong reasons but many are overlooked and in the echidna’s case unknown. Keep a look out for a platypus, bilby, potaroo among other lesser know animals. I’m hanging out to get pics of a platypus, bilby and/or potaroo. I’ve seen a platypus in the wild, but no photos yet. What a cool little creature – I’ve never seen one before! My husband is terrified of snakes – he googles which snakes are around every time we travel. I’ve lived in Australia for more than 30 years and seen three snakes in the wild, so you can tell your husband it’s okay to come here. Wow I agree with the students. It always sounds like you will meet up with these things for sure! This experience is so cool and the pictures are amazing! Thanks for sharing! Thanks for dropping by. It’s easy to worry about Australia’s deadly critters, but we hardly ever see them. I know I think it is so true, I have never seen a bear ha ha. It sounds like such a wonderful place and I have always wanted to go! When my kids ask where I would go that is it!! What about crocodiles? Crocs are a problem in the far north, but only if you are silly enough to go swimming where a sign says you shouldn’t. With all the talk of scary creatures in Australia lately and my highly edible self being “transported” to Australia in January this timely post gave me hope! Thanks Ralph. Glad you’re spreading the word that you won’t get eaten or poisoned in Australia. Glad you got to see some of Australia’s unique animals! We see lots of kangaroos and the wonderful birds, but hardly ever echidnas, so it was special. A great way for the Echidna to avoid a bad sunburn. Does earth in Australia have worms ? 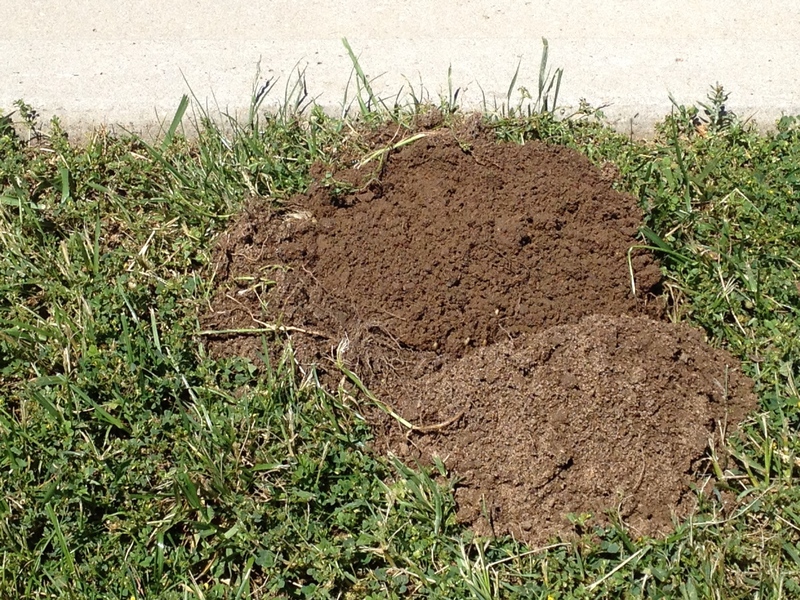 With all the digging by this critter maybe it also feasts on worms… or birds go over to help themselves to a meal or fishermen for fishing bait. We have plenty of worms in Australia—they’re a sign of a healthy garden. Some friends even run a worm farm for people who want to get more in their backyard. Echidnas don’t eat worms and I didn’t notice any in the mound this one dug up, so the birds missed out. Thanks for doing the series of pictures showing it bury itself. While I have seen some interesting critters, my dear you had a great encounter with the little guy. Sometimes it’s better to be lucky. Yes, I was very lucky to see the whole episode. I never saw an echinda in wild, but seen in zoo. We must try to preserve them as they may be endangered by urbanisation. Yes, I think they might be at risk. I hope I see more this season of their migration. Thanks Jane. Yep, I’m more worried when I’m on my bike in traffic. Great photos – I’ve never seen them doing this so close up! I did spot one the other day on the way to the block we’re about to build on, just outside Hobart. It crossed the road at a leisurely pace right in front of me and then buried itself in the bank under a bush. I have to laugh when friends in other countries talk about the dangerous creatures here. One lives in Canada and I pointed out to her that they have huge bears, porcupines and skunks! Thanks Heidi. So glad you have seen echidnas doing the same things. Have to say that your second comment made me laugh. You are so right when you say that people in other countries panic over our dangerous creatures and forget that they have their own. The wildlife is one of the things I love most about Australia. We are very seriously starting to discuss moving across the ditch and the thought of sharing my life with some of your amazing wildlife fills me with glee. I love the wildlife here too. So where in Australia are you thinking of moving? I have never heard of the interesting little critter! Thanks for sharing. My pleasure. They are pretty cute. I am so glad to learn of this little creature. At first, I thought it was a baby porcupine. Echidnas are so cute, and so prickly. Best watched from a little distance. I like observing and studying the wild life around me. This year, since moving to Texas I have learned about Roadrunners. Much more carniverous than I had thought and he likes to hang out on the patio furniture. I’ve never seen a roadrunner in the wild. Oh please do a post on them if you can manage to get some pics. I wasn’t aware of their carnivorous ways. Gives new insight into the Roadrunner cartoons. How lovely to see this guy! So glad you stopped by. I promise you that unless you go looking for crocs and snakes, they are most unlikely to find you. Echidnas are fascinating and you are lucky to get such great photos. I have only seen one once. Terrific post, Peggy. Thanks so much. 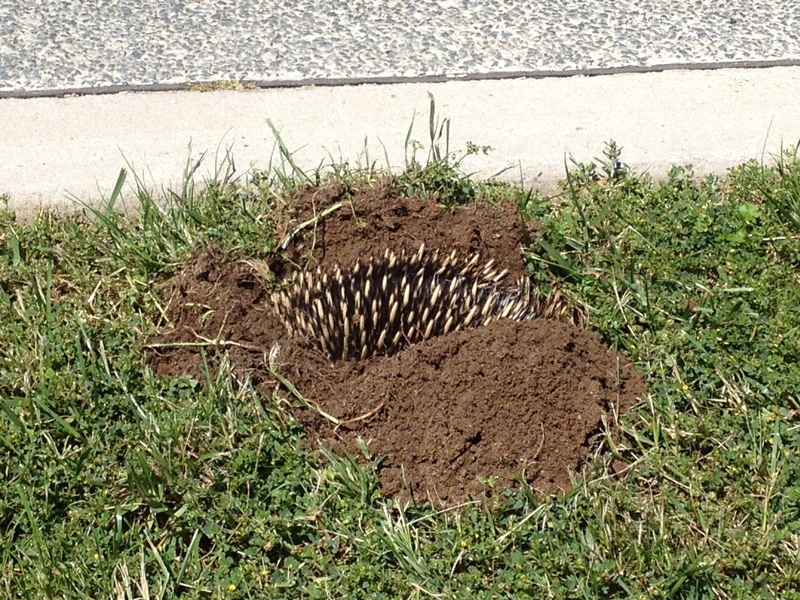 I’ve seen echidnas before, but this was the first time to see one dig in. I have never ever heard of echidnas. They are so unique! I thought they were porcupines at first 😛 How cute! They are cute and very similar to porcupines. A cool-looking animal, one I’d never heard of till reading your article. Thanks..
You’re welcome. I visited the lake and Commonwealth Park yesterday. The hole is still there, but the echidna has moved on. I’m really enjoying your blog and appreciate your interest in mine. I was so impressed that Indi behaved so well, but I think I’ve figured out why. These days when we go to Commonwealth Park, she likes to observe the bunnies. She’s realised that if she moves they escape into the bushes, so she stands or sits like a statue. Very perceptive pup. Roxie could use some Indi-tutoring in how to behave around other animals, but I think she’d give poor Indi a headache in the process. Just so you know. If Indi was off the lead/leash, she’d make a dash for the bunny and catch it. I’ve seen her do it in the bush where she can be off-lead. I ordered her to put it down. She did and the bunny hopped away, so at least she isn’t a killer.